The first attempt to image the Great Orion Nebula was back in 1880 by Henry Draper. Ever since then The Great Nebula in Orion is one of the most frequently photographed nebulae in the sky. The main reason for this is that it is the brightest and largest nebula in the northern sky. The first published observation of the nebula was done by Johann Baptist Cysat of Lucerne in 1611, published 8 years later. However in 1610, one year before Cysat a French astronomer Nicolas-Claude Fabri de Peiresc did mention the observation of the nebula in his records. Even the Mayans might had referred to the nebula in their creation myth as a smudge of smoke at the middle of the hunter's sword. Charles Messier first noted the object in 1769, and entered it in his catalogue as 42nd object. In 1880 Henry Draper recorded the first image of the nebula using dry-plate techology with an 11 inch refracting telescope. Three years later Andrew Ainslie Common also using dry plate process recorded several 60 minutes expositions with his 36 inch reflecting telescope of the nebula. The resulting images contained fainter stars and details of the nebula that could have observed visually. The Great Orion Nebula (Messier 42 and 43, NGC 1976 and 1982) is about 1300 light-years from Earth, one of the closest regions of star formation. All the nebulae in the picture, and many others surrounding them (including The Horsehead Nebula, Barnard's Loop, Messier 78, The Flame Nebula) are part of a much extended structure, the Orion Molecular Cloud Complex consisting of molecular gases mostly molecular hydrogen. 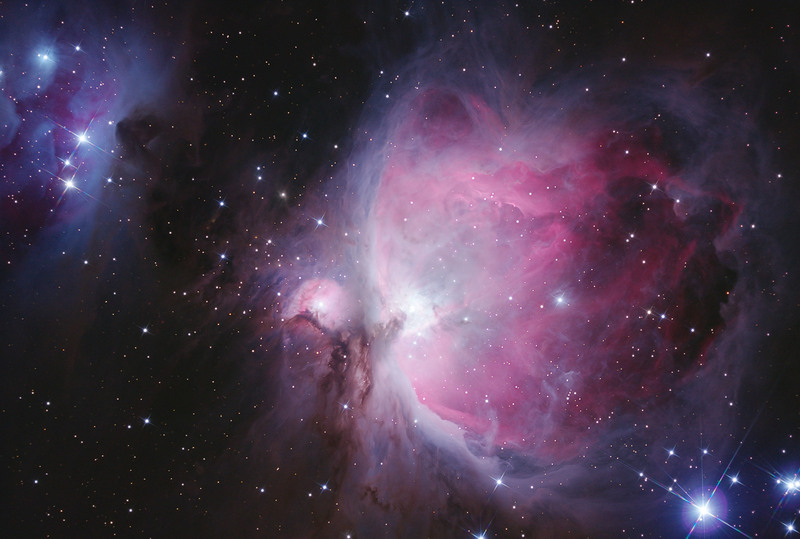 Due to its short distance from Earth, the Orion Nebula is the most studied nebula in the sky. All phases of star and planetary system formation can be researched in the object from contracting gas, protoplanetary disks to brown dwarfs and brightly shining hot young stars. In the center of the Orion Nebula a couple of young stars can be found, forming the asterism called the Trapezium. They generate the ultra violet radiotaion that ionizes the cloud, making it glow in red. The most massive star in the Trapezium is called "Theta1 Orionis C", which turned out to be a binary system. In a few million years it will turn into a red giant, and a supernova. Observing the nebula in infrared wavelenghts shows many newly born stars hiding in the cloud, based on this the cloud is also referred as "stellar nursery". Young stars including the stars of the Trapezium also emit strong stellar winds. When these winds encounter surrounding clouds, they form shockwaves in the gas. The pressure created by the winds also shape the cloud. These winds of young stars of the Trapezium has created a giant bubble in the cloud. Within the Orion Nebula a very complex system of stellar winds, jets and gas motions are present resulting the spectacular appearance of the object featuring wings, tails, bubbles, waves, threads. Runaway stars are moving at high speeds compared to the stars in their environment. Sometimes binary stars eject each other at very high speeds when their orbit becomes unstable. Also a supernova explosion in a dense cluster of stars may eject some of the stars. AE Aurigae, μ Columbae and 53 Arietis are all runaway stars located in different parts of the sky, however their origin is common. Tracking back their motion reveals that all of them ran away from the Orion OB1 association several million years ago.